The world watched in horror as coordinate attacks in Paris Friday night killed more than 130 people and left over 352 injured. Over 20 attackers have so far been part of the terrorist cell that planned the deadly Paris attacks, with seven suicide bombers dead, seven attackers under arrest and a total of six people on the run. Also Read: NO, We Can't Blame Edward Snowden and Encryption for Terror Attacks. The attacks were carried out by Islamic State (ISIS), who later claimed responsibility for targeting innocent people at 'soft' locations that lack police or military protection, including Bataclan concert venue where at least 89 people lost their lives. Following the bloody terror attacks, the hacktivist collective Anonymous declared war on the Islamic State (IS, formerly ISIS/ISIL) saying, "We will launch the biggest operation ever against you." From Where did the terrorist cell that planned the brutal terrorist attacks in Paris get Fundings? The Anti-terrorism group of ethical hackers, Ghost Security Group (GSG), said that ISIS regularly uses cryptocurrencies to fund its terrorist operations. The anonymous member of GSG has uncovered several Bitcoin addresses that they said, might be used by ISIS. One of the accounts they analyzed was found to contain $3 Million in US dollars worth of Bitcoins. Also Read: ‪Anonymous‬ Just Leaked list of 1000 ‎ISIS‬ Twitter Accounts. "The Islamic State does use cryptocurrencies as a form of income to fund their ongoing operations, and we have managed to uncover several Bitcoin addresses used by them," a member of Ghost Security Group said in an interview with NewsBTC. "We had discovered a BtC address linked to a known Islamic State deep website approximately three months ago and provided it to dw.com. They hired a team of blockchain analysts to trace the cryptocurrency to the estimated 3 million in BtC the discovered." 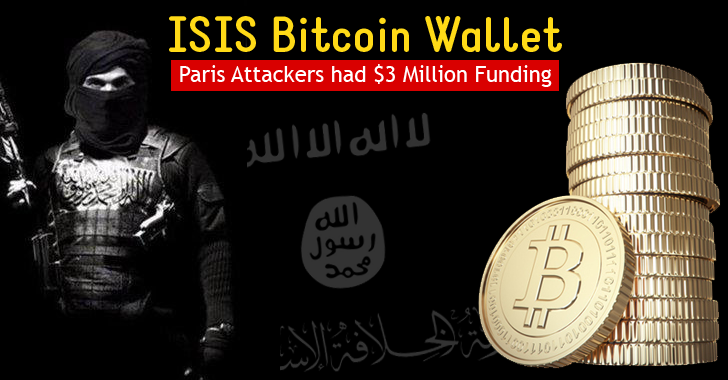 …it had uncovered several Bitcoin funding sites utilized by the ISIS on the dark web and successfully shut them down to limit the funding extremists receive through the use of cryptocurrencies. At the recent G20 summit, Russian President Vladimir Putin said that ISIS is financed by individual businessmen from 40 countries, including some G20 members. However, Putin hopes that the work with the G20 members in the fight against terrorism will continue. "I think that cooperation in fighting terrorism is very important," Putin told reporters. Putin also calls out Obama for arming and training Fighters for ISIS, saying U.S.-trained rebels were leaving to join ISIS with weapons supplied by Washington. “In my opinion, provision of military support to illegal structures runs counter to the principles of modern international law and the United Nations Charter,” Putin told reporters.